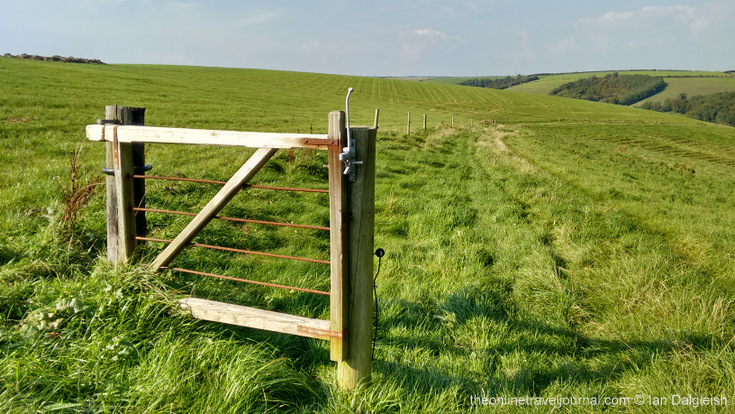 The aim of the campaign is to build the most comprehensive picture yet of the more than 140,000 miles of public footpaths that criss cross England and Wales so that they can be improved and protected. Our footpaths are something I’ve come to treasure both for the connection they give to the land and for getting out and keeping fit – for me they are very much part of the fabric of our landscape. Contributing to the survey is easy, once registered you pick a square (or squares), walk the paths and report your findings either via the app you can download or on the Ramblers’ web site. We decided on a square which included the Valley of Stones (it’s a valley scattered with sarsen stones of the kind found in megalithic monuments) – not far away from us in West Dorset, a little to the west of Hardy Monument but not somewhere we had walked before. 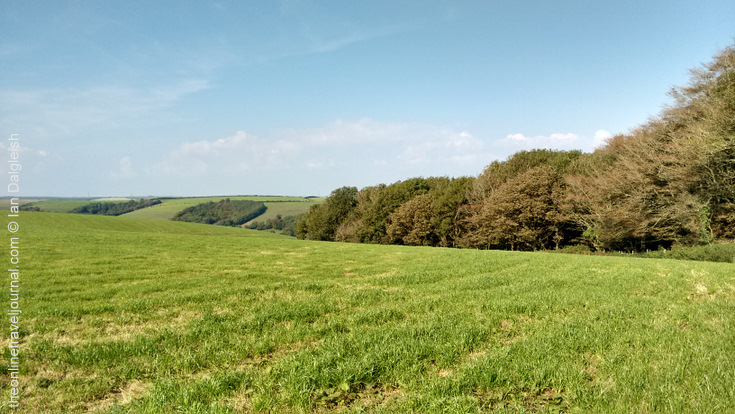 The landscape in these parts is full of signs of past habitation and activity; locally there are several hill forts, stone circles, burial mounds galore, strip lynchets, small disused pits and quarries, it must have been a busy place at times. We approached from the south taking the narrow B3175 road, (I see it’s called Bishop’s Road) from Abbotsbury to Martinstown, having in mind there was a convenient spot to park where the road swings to the right on Black Down – there is just where the South West Coastal Path crosses the road following the ridge. A short stretch along the road (less than 150m), then left onto a tarmac track for a similar distance and turning north we were on the track leading to the buildings marked as Toppart’s Dairy. 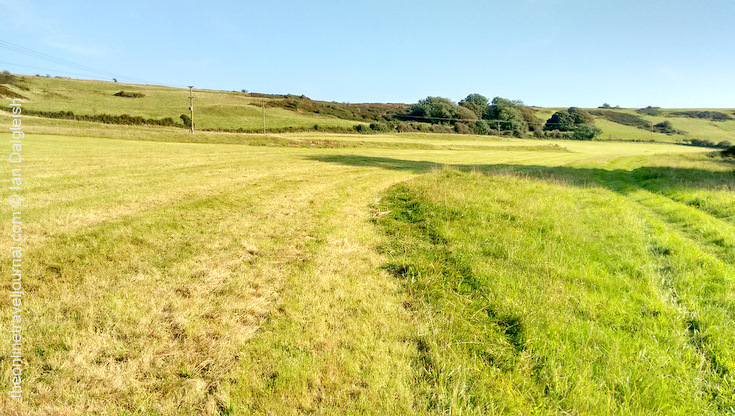 We had two public footpaths to survey in our square, this track, actually a bridleway to Littlebredy, touched on the western edge in a couple of places. I hadn’t realized that our square fell within a National Nature Reserve until we saw the Rural England sign board by a gate in the fence running along on our right (the blue bird symbol on the map should have alerted me). It meant we could actually roam over a good part of it on foot, but first the public footpaths to survey so onwards around the dairy. To the west these are the sort of patterns and shapes the Dorset downs throw up. 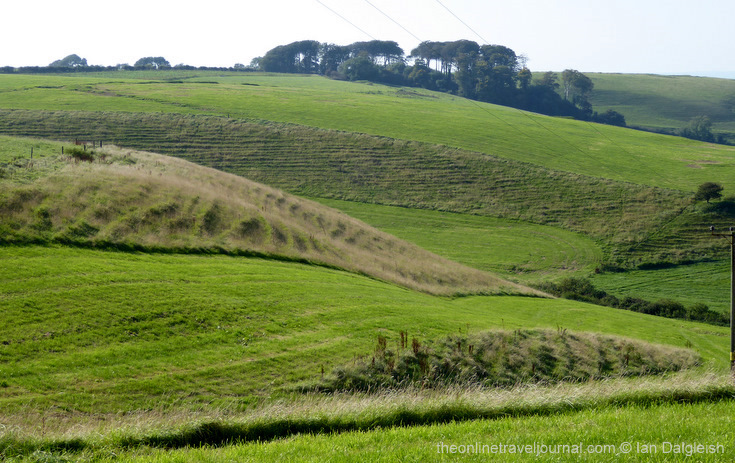 They make interesting photographs with the contours and contrast between mown fields and steeper untouched hillsides. Dipping back into the north-west corner of our square as we skirt Farm Wood. There’s no distinctive path but it’s easy to follow the edge of the fenced wood. We are leaving our square here and heading down the slope towards Littlebredy. No need to go through the bridleway gate but it was in good working order. Further on a small party of birds, not a kind we recognized, dipped in flight over the down, some returning to perch on the fence posts. From the hastily grabbed photo we think they were meadow or tree-pipits. Folded downs, looking south. 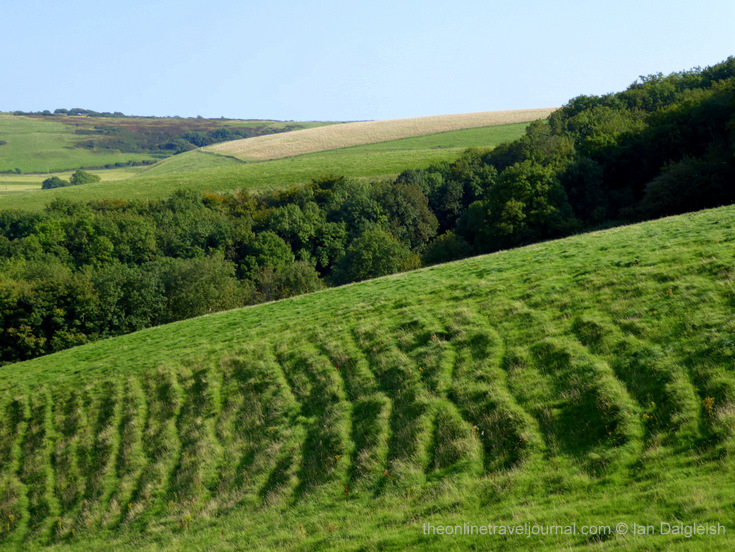 Distinctive ridges like these in the foreground are a common sight on the West Dorset hillsides, they’re caused by soil slippage and then become handy sheep tracks. Swinging anti-clockwise, looking roughly east south-east Hardy Monument comes into view. 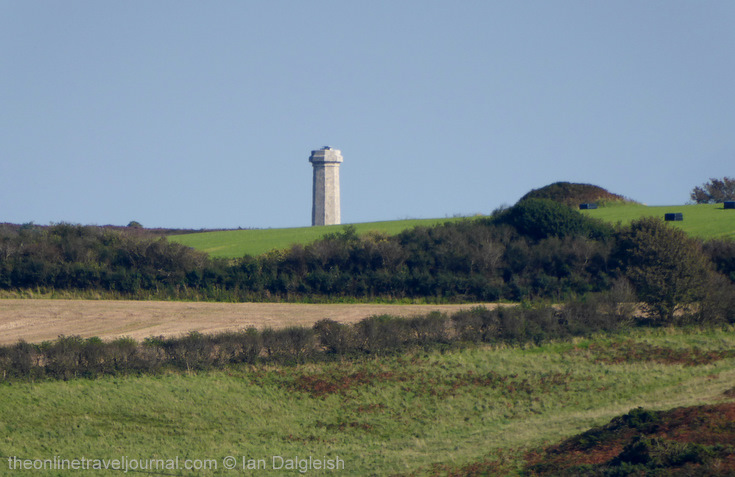 The solid shape of the tower erected on Black Down in memory of Vice-Admiral Thomas Hardy, flag captain of HMS Victory at the battle of Trafalgar and of “kiss me Hardy” fame, is a familiar feature on the skyline driving around these parts. For sailors too – Hardy’s family intended it as a landmark to be seen from sea. In recent years the tower has been renovated by the National Trust and you can now climb the 72ft to the top – the views should be good. And on the skyline to the north-east a stand of trees known as Heart Clump. You can see how the prevailing south-westerly winds have shaped the clump on this side. Bridehead House – Finding a large house in beautiful landscaped grounds at the bottom of the hill was unexpected. 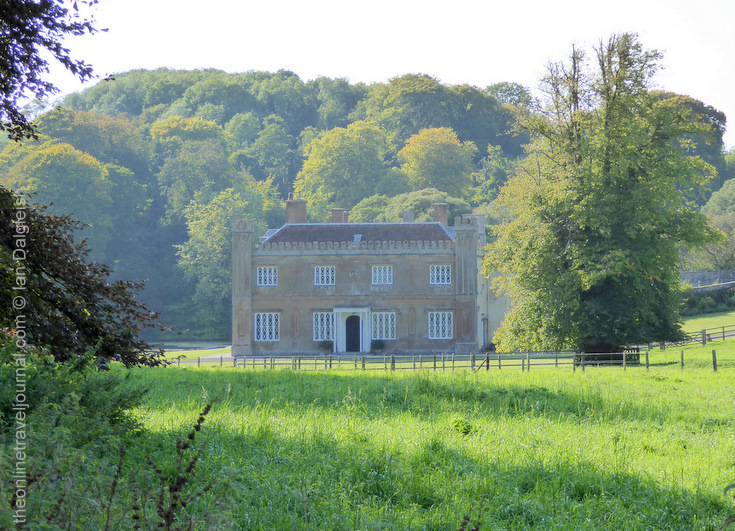 It dates from the early 17th century and is part of the Bridehead model estate. As the name suggests the River Bride rises here. Next door Bride Vale Cricket Club has an enviable rural setting. I really felt there should have been a field of players in whites and the sound of leather on willow to complete the scene. A right at the entrance to the cricket ground took us along the road to Littlebredy Farm where we took up the footpath leading back into our square. Another, more recent board by the look of it, gave us the low down on the stones we had come to see. Composed of flints and gravels cemented together with sand they come from the capping over the chalk that was broken apart by repeated freezing and thawing in the last ice age. We are back in our square here crossing a mown patch of meadow. The footpath goes in a straight line to the top of the ridge. Having walked its length (and found all in order) we dropped back down into the Valley of the Stones, off to the right in the photo here, to have a look at the stones. These stones further up the valley seemed more flinty, maybe a bit coarser in texture. On a first look from above there don’t look to be many stones but in amongst them you find more often well buried. It’s thought likely the valley was used as a quarry and sarsens taken off to be used in megalithic sites nearby. Whether there is a stone circle in the valley as is suggested, I’m not sure. Some sarsens form a circle of sorts but it might just be the way they have come to rest. A final look down on the Valley of Stones. We left taking the gate out of the reserve back onto the B3157 for the short walk back to the car, pausing to pick some fine blackberries from the hedgerows along the way. It had turned out to be a super walk, no problems to report on the paths, full of interest and much to think on. Take a look at the Ramblers’ Big Pathwatch page if you would like to take part or learn more. The survey closes on the 31st December 2015. Have you taken part in the Ramblers Big Pathwatch? Do tell us about the paths you walked.